The multi-course Christmas menu at the Hotel Astra, Bondi, offered such choices as Oysters Natural au Citron, Consomme Royale, Fillet of Sole Bonne Femme and Roast Muscovy Duckling à l’Orange. Accompanied by Chablis, Hock, Burgundy or Claret. It was an era when restaurants and hotel dining rooms with pretensions clearly thought a French menu added a touch of class. 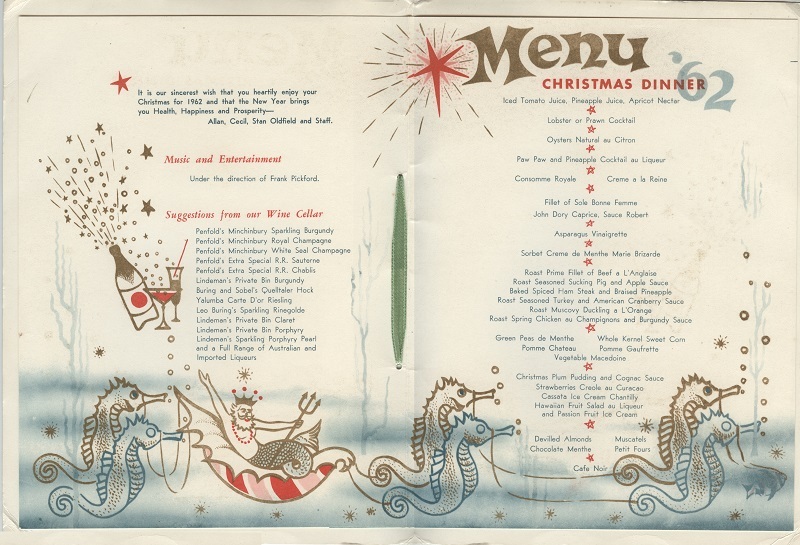 According to the Hotel Astra souvenir menu, Allan, Cecil and Stan Oldfield and Staff hoped that we heartily enjoyed our Christmas and that the New Year would bring “Health, Happiness and Prosperity” with a capital H, H and P.
Tastefully adorned with nautically themed illustrations, the multi-course celebration menu offered a range of classic dishes with impressive French names. Of course, if you were a real Aussie and a bit thrown by all the French, you could opt for Prawn Cocktail, Baked Spiced Ham Steak and Braised Pineapple and good old Plum Pud to conclude. “Suggestions from our Wine Cellar” included those popular fizzes Porphyry Pearl and Sparkling Rhinegold, and wines from several Australian makers who described their product generically as Chablis, Hock, Burgundy or Claret.